Ndf-13.teak Rectangular Extension Table In Set, Stacking Chair, Umbrella And Outdoor Cabinet. 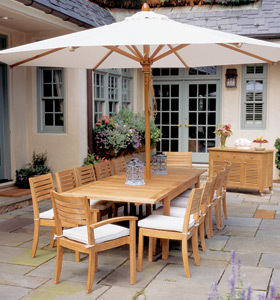 Teak garden set with stacking chair, Rectangular extension table, Cabinet outdoor and umbrella in white fabric, made from selected teak as we knew teak is the best wood especially for outdoor furniture. Suitable for home, hotel, garden, terrace, patio and outdoor restaurant. - 1 pc cabinet outdoor. With knock down table and stacking chairs made this set simple and easy to carry and storage, no big space needed. Competitive price : FOB Semarang port-Indonesia $ 521.00-685.00 / set. For further information about our products, please visit our online catalog and contact us.